Blue and John Crow Mountains is a remote mountainous region known for its biodiversity and relevance to the history of Jamaican Maroons. The park covers two mountain ranges: the Blue Mountains, peaking at 2,250m, and the John Crow Mountains which is a limestone plateau. They are covered with dense tropical, montane rainforest. A wide variety in endangerd and/or endemic plant, frog and bird species is found here. The region provided refuge to escaped indigenous slaves, the traces of which can be seen at Maroon archaeological sites such as hiding-places and a network of trails. The ‘Windward Maroons’ of the Blue Mountains region were one of two Maroon strongholds in Jamaica. They lived in and around the settlement of Nanny Town. Its spiritual association with living traditions, ideas and beliefs already earned it a place on the UNESCO List of Intangible Heritage in 2008. We stayed in a guest house for a few days. We hiked on marked trails and on one day we went on one of the ubiquitous and obligatory "hidden waterfall" hikes. Our guide made the history of the site come alive for us by pointing out the uses of all of the plants we encountered. We could understand how the Maroons could live in the jungle and have everything they needed. We did not hike to the summit of Blue Mountain, which requires getting up before sunrise to avoid the characteristic mists, because everyone we met that tried, climbed into a cloud (so no views). We visited a small coffee plantation and it was delicious! Believe the hype! The coffee is good. The people that live in Blue Mountains are friendly, opinionated and hospitable. My favorite combination. We enjoyed our visit very much and would recommend that anyone visiting Jamaica spend some time in the Blue Mountains. Maroonage: The region provided refuge to escaped indigenous slaves, the traces of which can be seen at Maroon archaeological sites such as hiding-places and a network of trails. 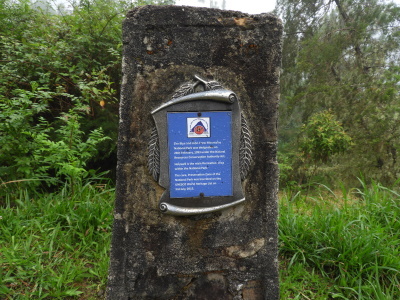 The ‘Windward Maroons’ of the Blue Mountains region were one of two Maroon strongholds in Jamaica.